Available in the Ghost Box Guest Shop now, this anthology of revised and updated articles from Stephen Prince’s A Year in The Country blog. Including considerations of the work of writers including Rob Young, John Wyndham, Richard Mabey and Mark Fisher, and of musicians and groups The Owl Service, Jane Weaver, Shirley Collins, Broadcast, the BBC Radiophonic Workshop, Virginia Astley and Kate Bush, the artists Edward Chell, Jeremy Deller and Barbara Jones and record labels Trunk, Folk Police, Ghost Box and Finders Keepers. A Year In The Country is a set of year-long journeys through spectral fields; cyclical explorations of an otherly pastoralism, the outer reaches of folk culture and the spectres of hauntology. It is a wandering amongst subculture that draws from the undergrowth of the land. As a project, it has included a website featuring writing, artwork and music which stems from that otherly pastoral/spectral hauntological intertwining, alongside a growing catalogue of album releases. The post A Year in the Country Anthology<br> in the Ghost Box Guest Shop appeared first on Ghost Box. The now annual event of a brilliantly baffling Moon Wiring Club release. In the Ghost Box Guest Shop now. Double CD with artwork by Ian Hodgson. TANTALISING MEWS could well be the definitive MWC Compact Disc experience ~ 2xCDs packed with 44 tracks derived from one of those streets or lanes that you pass every day but never go down. The architecture doesn’t quite fit in, the trees are different to all the neighbouring ones and it looks a bit too swanky for the postcode. 22 tracks of prime MWC tunes that display both rhythmic inventiveness and an ample eerie-ear for uncanny melody. Numerous dancefloor-friendly styles of music are co-opted to coax up a bewilderingly playful mix of synthwave-sinister eerie-step wyrd-funk favourites with ruminative interludes. There’s even a warehouse banger lurking in the shadows and the exact propulsive sound of a ghost processing fog. Contains 22 tracks of drifty-dream environment and mildly mildewed melody, a sweet-smelling feathering fog of wistfully romantic and unsettling moods, prescribed as a unsettling sleeping draught taken underneath a much-loved lavender blanket. Long-form beat-free compositions conjured up from an alternative 1980s perfume ad nestle charmingly next to a gaslight spirit-web of sly disassociation and mnemonic trickery. Ghostly apparitions wave from far-away lilac window-frames, and the fancy figure forming out of midnight-mist in the apple orchard looks really weirdly familiar. The post Moon Wiring Club<br> Visit the Ghost Box Guest Shop appeared first on Ghost Box. In the Ghost Box Guest Shop now, The Myth of Violet Meek, the new album by Oliver Cherer, on the lovely Wayside and Woodland label on beautiful bone toned vinyl. Cherer is also known as Dollboy and under his Gilroy Mere alias recently released the brilliant Green Line LP on Clay Pipe Records. If you go down to the Forest (of Dean) don’t dare to ask Who Killed The Bears? “There is a true story, about the hounding of some travelling entertainers and their dancing bears and how the bears were killed by a mob in revenge for an invented attack on a local girl in the woods between Cinderford and Ruardean. This is at the heart of the whole record.” writes Cherer. The post The Myth of Violet Meek <br> by Oliver Cherer <br>In the Ghost Box Guest Shop Now appeared first on Ghost Box. Available in the Ghost Box Guest Shop now beautifully compiled package by Folklore Tapes with written and audio contributions from 31 artists, including Ghost Box’s Belbury Poly. • Thirty-one track twelve-inch vinyl and download code. • Fourty page A5 pamphlet includes plantlore and illustrations from artists and herbal medicine section by herbalist Zoe Naylor. • Twenty eight page pocket A6 booklet Oak, Fern and Daisy: ‘The Folklore, Culture and Magic of the Plant Kingdom’ By Jez Winship. • Contains seed envelope harvested by the Folklore Tapes group. The post Folklore Tapes – Folklore of Plants LP <br>featuring Belbury Poly <br>in the Ghost Box Guest Shop now appeared first on Ghost Box. The Children of Alice is an occasional collaborative project between James Cargill (Broadcast), Julian House (The Focus Group) and Roj (Roj). On this eponymous LP Warp records have compiled their output to date, originally released over a series of compilations and a split cassette for the Folklore Tapes. A beautiful mirrorboard sleeve with fold out poster designed by Julian House. Includes download code card. Named as an act of tribute to the late Trish Keenan, for whom Alice in Wonderland and in particular Jonathan Miller’s summerhazy ’60s idyll of an adaptation, was a presiding inspiration. The name invokes her abiding spirit and also creates a sense of continuity with the evolving Broadcast soundworld, which became more concentrated and individual as it refined itself and adapted to new configurations. The record combines a narrative of country life rooted psychedelia with a strong soundtrack feel that perfectly fits and continues the lineage of the three members’ individual projects. Children Of Alice plays out like a long lost library soundtrack, complete with all of the trademarks of the trio’s collective consciousness, filtered through a gauze of Czech new wave cinema soundtracks, 1970s cult children’s TV shows such as The Owl Service & Children Of The Stones and then shot through the record collections of Julian Cope, Bo Hansson, David Chatton Barker & Ian Humberstone. A truly engrossing listen from start to finish, Children Of Alice is a spellbinding journey down the rabbit hole, that for those willing to take the trip there is much to discover. An album that excavates a dreamlike sound of wonder. in the Ghost Box Guest Shop appeared first on Ghost Box. 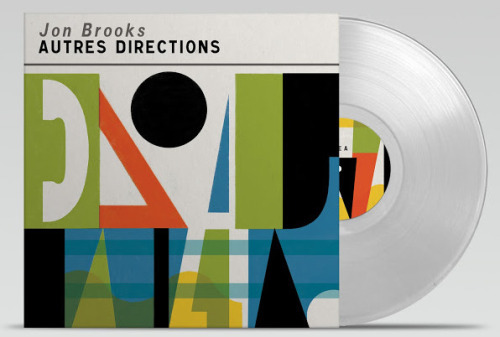 We have secured the very last of the first pressing of Jon Brook’s (The Advisory Circle) Autres Directions. This beautiful and meditative album for Clay Pipe Music takes inspiration from the French countryside. The Guest Shop copies are from , a hand numbered limited run of 500 clear vinyl copies. Including a free download code card. Artwork and design by Frances Castle are to the usual high standard of all Clay Pipe releases. Part episodic series of ethereal soundscape canvasses, part field recording driven hauntological essay, part ambient/prog reinterpretation of the kind of approach the likes of Pink Floyd, Harmonia or Eno were aiming for in the 1970’s – In totality it reflects all of this whilst retaining its own robust identity and makes for a deeply immersive sonic experience that reveals great depth with repeated listens. As impressive and immersive as anything I’ve heard, this collection is a testament to Brooks’ skill as a sound designer and songwriter. Unsettling pastoral electronica on this 5th CD album from Keith Seatman. He’s joined on two tracks by vocalist Douglas Powell. Surreal retro analogue visions slide in and out of haunted fever dreams in this woozy, uniquely psychedelic, Radiophonic-flavored concoction that’s suffused with ambivalent subconscious. Howlround’s immersive and awe-inspiring soundtrack to a film by Steven McInerney. The heavyweight 180g vinyl LP comes with printed inner sleeve, digital download and a link to stream the full 27 minute film in HD online. This recording may be Howlround’s most substantial statement to date. As a rumination on both the firmament and the infinitesimal, A Creak in Time is timeless and singular: a cinematic triumph of style and substance. Howlround will be performing A Creak in Time at DJ Food’s Further in West Norwood, London, this Saturday night 6th May. Along with a four screen film show and DJ set from Ghost Box records, and film and music from DJ Food. Jon Brooks, Howlround & Keith Seatman appeared first on Ghost Box. There are two new beautifully hand crafted items in the Ghost Box Guest shop this week. 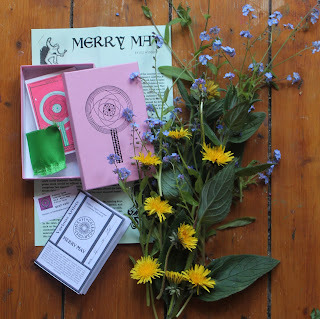 First is the delightful little cassette compilation box set from Folklore Tapes called Merry May. A dual format compilation featuring a rare appearance from James Cargill, Julian House & Roj’s Children Of Alice project (Broadcast and The Focus Group), Liverpool psyche heads Carl Turney & Brian Campbell, label owners David Orphan and Ian Humberstone as well as long time associates Sam Mcloughlin, Rob St John and more. “The artists contributing to this compilation have each researched a particular May ritual and, informed by their findings, conjured a piece in response. As such, the cassette takes its listeners on an audiological journey where, mounted upon clacking Hobby horses, they will meet with May Birchers and Dewers, reel around Maypoles and parade the streets in the company of the Earl of Rone and the Fool. And a perfect complement to this is Hollow Earth Hippies by ToiToiToi, the work of Sebastian Counts, an electronic musician based in Berlin. His sound is bound to appeal to fans of Ghost Box, being a timeless melange of ethnography, TV music and psychonautical exploration all rendered by analogue electronics, tape and samples. Its weird, witty and engrossing. ToiToiToi will be releasing a single on Ghost Box for the Other Voices series later this year, but meanwhile we’d urge you to delve into this beautifully packaged, self released debut. 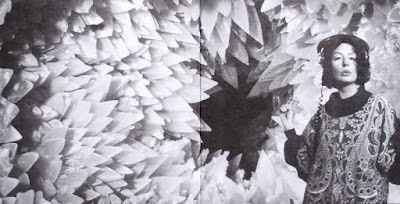 Hollow Earth Hippies is a 15track CD-r with beautiful handmade cover and booklet. There’s very few left of what is destined to be a collectors item. Both are available here in very limited quantity right now. Public Information’s marvellous compilation picked from 30 years of electronic cues from the Standard Library label, is available now in a gorgeous double LP package in the Ghost Box Guest Shop. “Unofficial sequel to our Parry Music compilation from 2012, here again we step into the world of library. With official permission granted from the label itself we have selected 31 tracks from UK library music institution Standard Music spanning 30 years of electronic play, this is Happy Machine. Standard Music Library was established in 1968 as a partnership between independent music publisher David Platz and London Weekend Television. Themes and incidental music for hit LWT shows like Black Beauty, Upstairs, Downstairs, On the Buses and The Professionals, were written under Standard’s wing. A breathtaking who’s-who of musicians recorded under the Standard banner, pressing up records that are now found in the rare as hens-teeth zone; Brian Eno, Delia Derbyshire, John Gregory. Those who feature on Happy Machine include… Brian Hodgson, John Kongos, Richard Thair, John Keating, Mike Vickers, Marco Pirroni and none other than Beatles producer George Martin jamming out on a Moog…..These characters and more are nestled comfortably here on Happy Machine as we try to make sense of our favourite electronic moments from this incredible library.